Doha (الدوحة‎ Ad-Dōḥah) is the capital and largest city of Qatar, and has well over 1,350,000 inhabitants in the city itself, rising to over 1,500,000 when the whole of the urban area is considered. This means almost 90% of the total population of the country lives in the capital, one of the highest in the world. 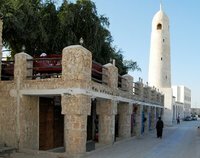 The city is located along the central western coast of Qatar and, like some cities in neighbouring countries, it is a combination of modern and traditional buildings such as mosques, with a large expatriate population. Although most travellers don't stay longer to see the city itself, there are good hotels catering to package tours from Europe and it is gaining popularity among people who want something different than Dubai. Founded in early 19th century as part of the Al Bidda settlement and subsequently developing as an independent territorial entity, Doha was declared Qatar's capital upon the country gaining independence in 1971. Doha was where the ancestors of the current ruling family of Qatar, the Al-Thanis, migrated to in mid-19th century. Currently, there are over 50 districts in Doha, including West Bay, Al Dafna and Al Bidda. Experience the amazing building boom of downtown Doha. New and crazy buildings are going up every minute in this city that was nothing more than a few adobe structures a century ago. One of the most interesting is the Aspire Tower, opened in 2007, which is 318 metres high located in Sports City in Doha. The tower dominates the cityscape and offers great views from the top. Also seeing the city lit up at night from across the bay is amazing! Doha's newest architectural addition is the I.M. Pei-designed Museum of Islamic Art. Opened in December 2008, it sits on its own island at the southern end of the Corniche. Despite the Islamic treasures within, the real star is the building itself which incorporates Islamic design features and motifs. Entry is free and no trip to Doha would be complete without a visit. The building, collection and associated library and study centre have been put together with obvious pride in a thousand years of Islamic achievement. Large shopping malls have sprung up in recent years with many world class brands opening outlets. This is one of the best places in the world to buy an expensive pen or watch! One of the most spectacular malls is Villaggio. Built on a Venetian theme it even has a canal running through the middle on which you can have a gondola ride. It seems no mall is complete without an ice rink (Villaggio and City Centre) or a fun park (City Plaza and Hyatt Plaza). For a more genuine Arabian shopping experience visit the souqs in the centre of the city. The Souq Waqif (the Old Souq) has been rebuilt in ancient style even though most of the goods sold are more modern. Locals come here to buy toys, clothes, hardware and food. Similar shops and stalls are grouped together. It's a great place to buy souvenirs, some of which you won't find anywhere else while others are sold in the shopping malls at much higher prices. Bargain to reduce the price even further. Don't leave before looking in on the falcon souq. Falconry is a popular sport amongst Qataris and you can buy all kinds of falconry accessories and equipment including the birds themselves which cost thousands of rials. On the roads outside the Souq Waqif are many other shops selling clothes, phones and electronic goods. Near the bus station is the gold souq where jewellery of all kinds can be bought. Bargain the prices down and be prepared to go to the next shop where you may get a cheaper price for the same item. If you have the time, jewellery can be made to your specification. Shops are open from about 8:00am but often close during the afternoon and reopen again in the evening. The shopping malls are usually open from 10:00am to 10:00pm. Only supermarkets and grocery stores are open during the day on Friday (the holy day) but everything comes alive every day in the evenings when all the shops are open and the streets are full of people. Golf - Hit a few balls at the Doha Golf Club, but bear in mind it's not cheap! Desert Safari - Climb 60 metres sand dunes and see the inland sand sea. Oryx Farm and Equestrian Club - Watch these pure Arabian horse up close and personal in their original habitat. Boating - Go for a motor boat ride or sailing in the amazing bays around Doha. This is the festival that immediately follows Ramadan. It usually falls in the month of August or September, and is celebrated across the country. However, Doha certainly offers the more festive atmosphere. Feasts, dancing, and performances are usually held during the event. The Islamic month of fasting, called Ramadan, is an important time of the year in Qatar. During the daylight hours, the country is relatively quiet. However, when the sun goes down, fasting is put aside, and locals enjoy a celebratory atmosphere almost every night of the week. Families are often eating feasts, and several areas around the capital city, Doha, are important spots for celebrations. Ramadan usually falls between mid-August and early September. Local artists are extremely talented, so Qatar puts on the Art Festival each December. Many of the art galleries and museums hold exhibitions during the event to showcase local artistic talent. The event also includes artists from nearby Arabic nations, including the United Arab Emirates and Saudi Arabia. During the month of March each year, the capital city of Qatar is home to the Cultural Festival. Attracting thousands of visitors annually, this important festival showcases the cultural uniqueness of the area. Traditional music, dance, costumes, and cuisine are mostly found throughout the event. The Doha Tribeca Film Festival is one of the Middle East’s most impressive international events. Film enthusiasts, actors, critics, and directors come from across the globe to enjoy this yearly event, which is held in the month of October across Doha. It lasts for a total of five days and only began in 2009. Nevertheless, it has quickly grown into a reputable global film festival. Beginning in 2010, the Qatar Marine Festival occurs in the month of March each year. It is held at the famous Katara Cultural Village along the Doha seafront. Musical performances, seal shows, aquatic animal displays, and many other features are found at the event. Every year, this interesting festival keeps getting bigger and bigger. In February, the Doha Golf Club plays host to the Qatar Masters Golf Tournament. Many of the world’s best professional golfers flock to Doha to compete in this tournament, which has been operating since 1998. Thousands of visitors come to the capital of Qatar for this event too. Doha accommodation should be booked in advance, as the Masters Tournament is quite a reputable event drawing in many thousands of spectators. Played at the Khalifa International Tennis and Squash Complex, the Qatar Open Tennis Tournament is a popular tennis event, held in January. Many of the sport’s biggest names come to Doha to compete in the event, which means thousands of tennis-lovers also make their way to the Qatari capital. Roger Federer is a yearly competitor at the Qatar Tennis Open. Doha is the focal point for the National Day festivities, taking place on (and in the run up to) December 18 each year. Doha has an arid climate with warm to hot weather. There is no rain whatsoever from May to October. From November to April, there are about 2 to 6 days a month with some rainfall, totalling less than 100 mm of rain a year. Temperatures are pleasant from November to April. January is the coldest month with average maximum temperatures of 20 °C, dropping to 13 °C at night. June and July are the hottest months with daytime temperatures averaging 40 °C and nights still around 30 °C! Temperatures hitting 50 °C are not uncommon during summer and together with sometimes humid conditions makes this time almost unbearable. Doha International Airport (DOH) is the only airport in Qatar. It is one of only three airports in the world with flight to all 6 (inhabited) continents. The others are Johannesburg OR Tambo International Airport and Dubai International Airport. Taxis and shuttle services are widely available to get you to your destinations in Doha or other places in Qatar. Most flights to and from the country are with the national airline Qatar Airways, rated as one of the best airlines in the world. Destinations of Qatar Airways include Nairobi and Dar es Salaam in the east of Africa, South African cities of Cape Town and Johannesburg, all countries in North Africa, major cities in Asia, especially in China, India and Pakistan, plus main cities in Europe. The United States is served as well, with flights to and from New York and Houston. Neighbouring countries and other countries throughout the Middle East have connections on almost a daily basis and lots of other regional airlines fly to Qatar as well. Qatar only land border is with Saudi Arabia in the south. However, this is rarely an option, as obtaining permits to drive through Saudi Arabia can be extremely difficult. Early plans are underway to connect Qatar using bridges with both Bahrain in the northeast and the United Arab Emirates in the southeast. Saudi Arabia Public Transport Co travel between Doha and Dammam in Saudi Arabia, with onward transport to Amman, Damascus, Al Manama, Abu Dhabi, Dubai and Kuwait. Again, you need a valid transit visa for Saudi Arabia and a visa and onward transport for you next destination. Mowasalat offers brand new buses that ply the routes between Doha and most major towns in this small country. Several ferries and fast catamarans travel between Iran and Qatar. Connections include Bushehr to Qatar. Check the Iran Traveling Center for more details about schedules and prices. Rental cars are available and companies such as Europcar have offices in Doha. But beware speeding and reckless driving is very common on Doha roads where drivers are very pushy and take quite unnecessary risks for little apparent gain. This behaviour seems to be taken in good grace by other drivers and there are no incidents of road rage. Traffic jams are common in peak hours in the city and on the main roads. Taxis are government run, clean, metered and well regulated. They are easy to spot with their turquoise livery but there is a shortage, so don't expect to be able to hail one easily in the street and if making a booking do so well ahead. Having said that, it is not uncommon for taxis to cruise the bus stops where several passengers may get in to share the fare. Government buses, turquoise like the taxis, are the only form of public transport in Doha. Most of the bus routes start and end at the main bus depot in the centre of Doha although there are other routes on the outskirts of the city. The system is not very extensive and service frequency is not more than about every 20-30 minutes. They are cheap however, with a flat fare of 3 rials (US$0.80, €0.60) per trip. This makes them well patronised by many of the guest workers from India and other parts of the subcontinent. They can be quite crowded especially in peak times and on certain routes. Be prepared to push through to get out and to shout to the driver to make sure he stops at your stop. If they go to the places you want to go, and you don't mind the waiting and the crowding, they are a good way of getting around. As part of the country's preparations for 2022 Football World Cup, Doha metro is expected to open in 2018/2019, with 3 lines connecting the airport to the city and linking major attractions and future World Cup venues. Doha is not really a walking city with footpaths often non-existent or in poor condition. In the centre of the city however, the souqs, Corniche, the Fort, Museum of Islamic Art, bus station and other things of interest are quite close together and walking is the best way to get around. The Corniche, an 8-kilometre promenade on Doha Bay, is full of people walking on weekends and public holidays. Westerners walking anywhere outside the centre of the city may be subject to some interest from drivers who slow down to have a look and may even offer you a lift. Cyclists are few and far between in Doha, even though it is flat, easy to navigate and not very big. Only the crazy driving makes it less than perfect for cycling. However, efforts have recently been made to increase the popularity of cycling in the city, including the annual Ride of Champions event. Given the population diversity in Doha, there is a large variety of different types of cuisine, including Indian, Thai, Chinese, Italian, Korean and, of course, typical Middle Eastern food. Since Qatar is a Muslim country, all food is certified halal. Note that pork is not sold in restaurants and bars as it is considered to be restricted by the Muslim religion. Alcohol is strictly regulated in Qatar, as it is a Muslim country, and for visitors is only available in bars attached to large 5-star international hotels. Bars are required to see identification (i.e. a passport) at the door, although this is rarely enforced. Residents with a special liquor license may purchase alcohol at the QDC (Qatar Distribution Company) on the outskirts of town. Importing alcohol is not permitted - all bags are x-rayed upon arrival and any alcohol will be confiscated and held for you. With a claims receipt you can pick up your bottle again when you leave. Glo and Champions bar at The Marriot Renaissance. Wahm and Crystal at The W.
Do carry your original passport as clubs and bars are quiet strict on legal age, which is 21 years. Compared to Dubai, which has hundreds of accommodation facilities, Doha does not offer that much variety with less than a hundred hotel properties and some other accommodations. There are quite a few five-star international chain hotels in Doha with recently built five-star hotels, such as the Ritz-Carlton, Four Seasons, and Intercontinental. The list is likely to expand ahead of the 2022 Football World Cup. More modest choices come in shorter supply. Sheraton is the city's oldest international hotel, having opened in 1983 on the Corniche. Qatar has a fairly efficient postal system run by Q-Post. There are dozens of post offices scattered across Doha, along with branches in many major cities. It costs QR 2.50 to send a standard postcard to most Western countries. The price drops down to QR 1 to 1.50 when sending a postcard domestically or to most nations within the Middle East and North Africa. Sending parcels can get costly, being counted per kilogram and by distance. We have a comprehensive list of accommodation in Doha searchable right here on Travellerspoint. You can use our map to quickly compare budget, mid-range or top of the range accommodation in Doha and areas nearby. This is version 40. Last edited at 9:18 on Dec 27, 17 by Utrecht. 59 articles link to this page.